Posted November 28, 2015 by Heather Michet & filed under Crow Living, DIY, Recipes. Hummingbirds are a wonder: they fascinate, delight and dazzle us with their antics, crazy metabolism and beauty. When you think of these little winged motors, do you see them zipping about in the winter cold or only spring, summer and early fall seasons? There are a number of species that do not migrate to Central America, but stay in various parts of the U.S. Anna’s Hummingbird remains in the Pacific Northwest through the most rugged of winters. 4 parts white sugar* Use only white sugar. Do not attempt to “healthify” the nectar by using raw cane sugar or honey. It doesn’t hold up well or appeal to the birds. And definitely do not use any artificial sweeteners or other sugar substitutes. Place water and sugar in saucepan with lid. Stir well as you bring to the boil. Turn the heat down to keep the nectar simmering lightly. Simmer for 4 minutes. Allow to cool completely before adding to feeders. Store any remaining nectar in the refrigerator. *When making nectar for winter feeding, you can ramp up the energy in it by increasing the sugar to water ratio to 3:1. **Do you notice what is NOT added to this recipe? Food coloring. Chemical-laden, artificial food coloring. Despite commercial nectar manufacturers’ “reasoning”, the birds do not need colored nectar to find the feeder. They do just fine without the extra toxins, thank you very much, and so does your body. If overnight temperatures drop into the 20’s (degrees Fahrenheit) in your area, bring the feeders into the house to keep the liquid fluid. Once dawn begins, rehang the feeders outside so the very hungry beauties can tank up on fuel for their busy day. When refilling feeders, be sure to clean all parts thoroughly to remove bacteria and the black biofilm that often forms on the glass and plastic parts. 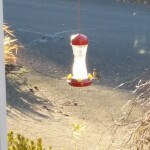 Once your feeders are hung outside for these bejeweled birds, sit back and enjoy the show!